Located in a unique environment, a landscape in which you will discover a natural area to enjoy a sustainable and ecological tourism. Hot water and electricity is generated with solar panels. The access to the property is via a narrow, winding one-lane road, accessible by car, with leafy trees forming an oasis in the middle of nature: trees, light and quiet, elements that make it attractive stay in the house. The road can be steep at points: 15%. Many walking trails and river where you can take a refreshing swim in summer. There is no possibility to use a hairdryer in this home. The property is perfectly suitable for you to escape the stresses of daily life and to enjoy the surroundings in peace. Reconnect with the different cycles of the year: spring and summer seasons that allow you to plan pleasant excursions in the mountain, autumn to enjoy a landscape of incredible colors and winter to go skiing in the nearby ski area Vallter 2000. 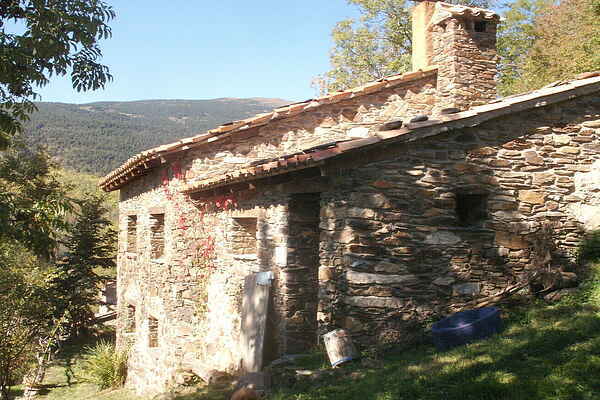 Warmth of wood and stone covers basic needs for a family stay. The house is provided with sheets and towels, kitchen, gas oven, wood boiler and orchard. Capacity: double bedroom and wooden loft with single bed, (and also with a double mattresses), porch. Car park outside the house. In winter, chains are advised and you will have to park at 250m from the house.